Egg yolks are an excellent source of sulphur – a nutrient that helps with the production of keratin and cartilage, amongst other important things! Eggs contain good levels of Vitamin D. Lack of this essential nutrient often causes excessive hair loss, fatigue and dull skin. B vitamins help your body convert carbohydrates into energy that can be used by your cells. Hair cells are the 2nd fastest dividing cells in your body and require a lot of energy to grow – and keep growing! Iodine helps maintain healthy thyroid function. Hypo or hyperthyroid are known to trigger hair loss and excessive shedding in certain individuals. 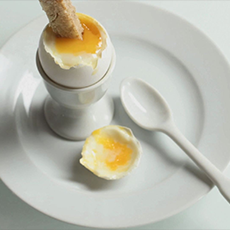 Note: If you are concerned about egg yolks and their effects on cholesterol, you can opt to eat egg whites only. While it is debated whether or not egg yolks raise ‘bad’ cholesterol, you should nevertheless try to eat things in moderation as part of a well-balanced and varied diet.